Grave / Reference: II. A. 28. Relatives: Only son of Arthur Edwin and Alice Maria Barr. Address: "Hill View," Hadleigh, Suffolk. Henry ‘Harry’ Edwin Barr was born in Hadleigh and went to Bridge Street School. In 1911 he was an assistant to his father who had a grocer’s shop at 77 High Street (now Hadleigh Pet Supplies) and was living across the road at 74 High Street, the Crown Inn where his grandfather was the landlord (this is now Andrews butchers). 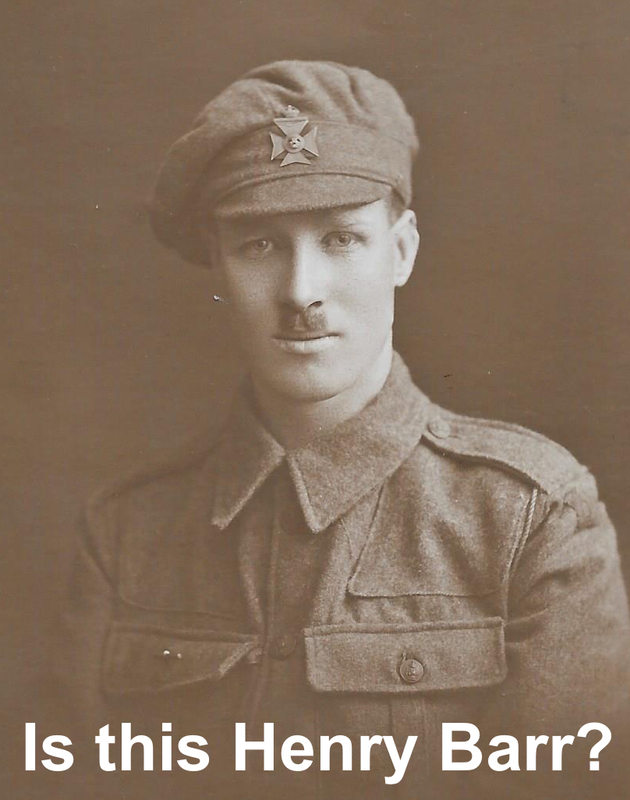 For reasons so far unknown Henry Barr later moved to London and was living in Harrow Road, from where he enlisted in the County of London Regiment early in the war. He arrived in France on 6 June 1915 and was serving with the 9th Battalion of the London Regiment, also known as the ‘Queen Victoria Rifles’. On 1 July 1916 Henry’s battalion took part in a major offensive just north of the Somme battlefield around the town of Gommecourt. This was a diversionary attack to draw German attention away from the main Somme battlefield. However, like the Somme, the action at Gommecourt did not go well and the battalion suffered heavy losses. In September the Battalion moved south to Carnoy and Fricourt and at the end of October moved closer to the Belgium border at Neuve Chapelle where they spent Christmas. 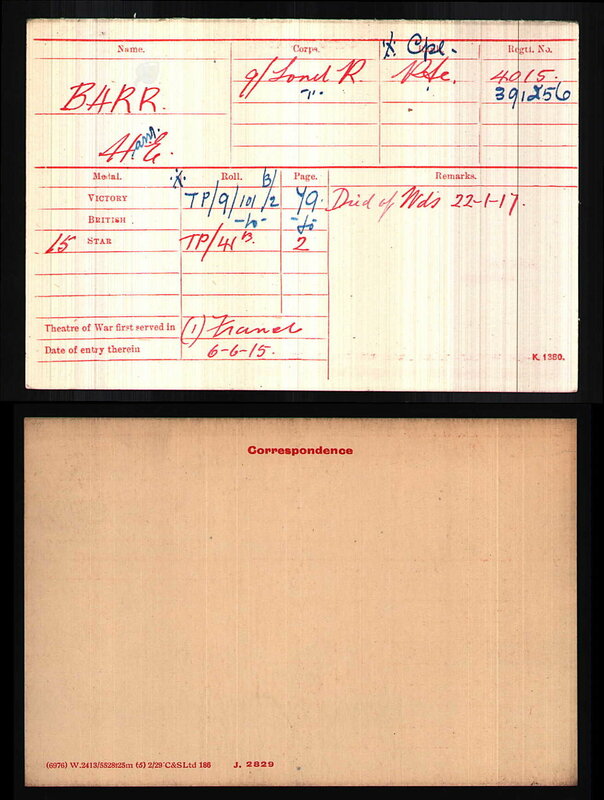 In mid-January 1917 the war diary records; “Battalion in trenches and holding Posts in old German front line. Posts heavily shelled and 1 post raided by enemy on two occasions. Considerable loss caused to our garrisons.” Henry was one of these casualties and was initially wounded but subsequently died of his wounds. This is the Jan 1917 page although it shows 1916 at the top of the date column. Henry was buried at the Merville Communal Cemetery Extension and is remembered on the Hadleigh Memorial. The whereabouts of Henry 's medals are not known, however, he was entitled to the above three medals. The photograph shown was handed in to the Hadleigh Thrift Shop and shows a soldier wearing the ‘Queen Victoria Rifles’ cap badge and so could possibly be Henry. If you can confirm or deny this then please let us know. 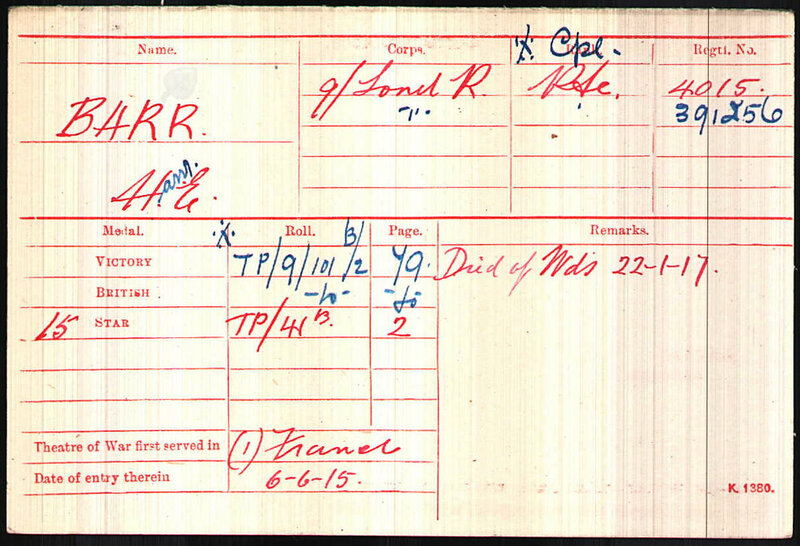 We hope that this page has been able to tell the story of Henry Edwin Barr. If you know of any information which might help to add to the story then please get in touch.